School is back in session, which means feelings are front and center for the start of a new year! 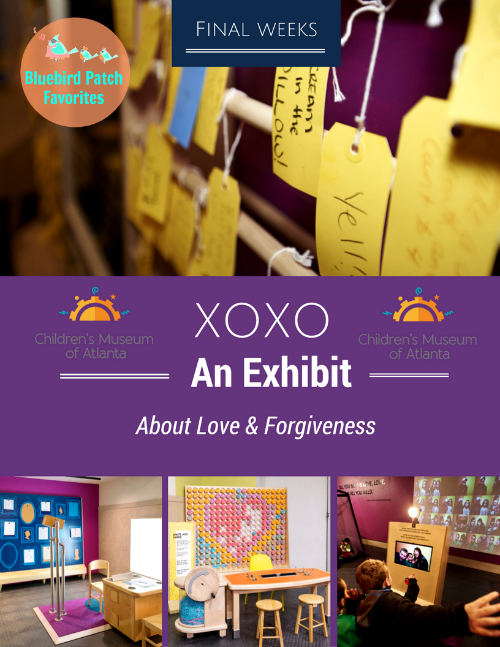 While kids adjust to the hustle and bustle of fresh beginnings, now is the perfect time for families to head to Children’s Museum of Atlanta’s exploratory exhibition XOXO: An Exhibit About Love & Forgiveness before it closes on Monday, September 5! Offering an introspective look at the power of emotion and its impact, children will explore these feelings through 14 different engaging experiences including a response wall, story puzzle, empathy blocks, a reflection table, art making stations and more! Each of these brightly colored spaces is designed to help children understand, appreciate and express how they feel in an interactive, hands-on environment! Monday, Tuesday, Thursday and Friday: 10 a.m. –4 p.m.Weekends: 10 a.m. –5 p.m. Entrance to the exhibit is included in each regular admission to Children’s Museum of Atlanta. Admission for ages 1-100 is $14.95 (+tax). Children under 1 are FREE. For more information or to purchase tickets to XOXO: An Exhibit About Love & Forgiveness, visit bit.ly/CMAXOXO.